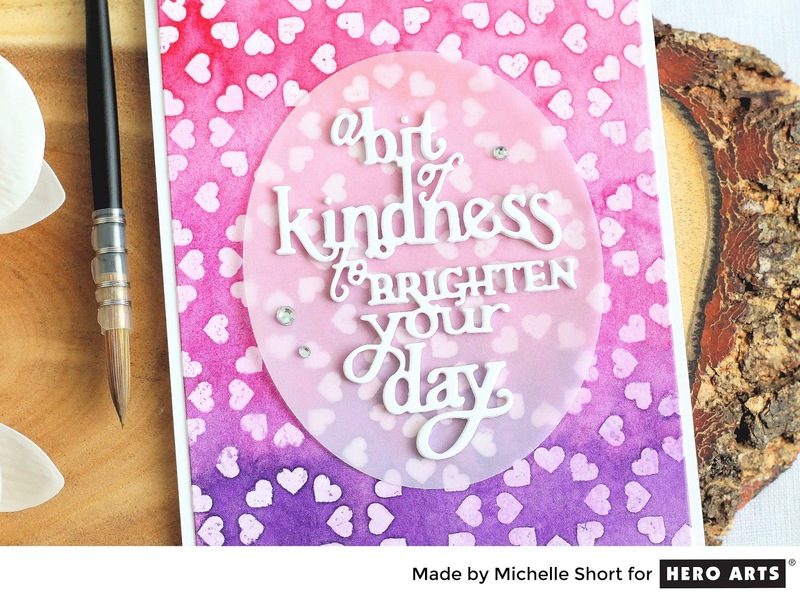 Hello there, today I am over on the Hero Arts Blog and You Tube Channel sharing a card using the A Bit Of Kindness Fancy Die. I paired it up with the Heart Pattern Bold Prints to make a fun background for the wording. Here are the links to what I have used on the card. Affiliate links are used on some products. This means that if you make a purchase after clicking on my link, I receive a small commission with no extra cost to you. I truly appreciate your support when using these links. Please click on the letters below the product to shop at your favourite store - Simon Says Stamp (SSS), Hero Arts (HA), Seven Hills Crafts (SHC) Amazon (AZ) etc. You can see the details of how I made the card over on the Hero Arts Blog and you can see the video directly over on You Tube HERE. If you buy any of the kindness products, not only are you buying a great product, you are also doing some good. Hero Arts donates 25% of profits from these products to the Kind Campaign which aims to prevent bullying. Thanks so much for popping by today, I hope you have a great week! I love this, the background is beautiful.